activities enable us to gauge the exact positioning of the underground remains and to better understand the archaeological potential of the site prior to the investment of further resources to fully uncover the remains through excavation. 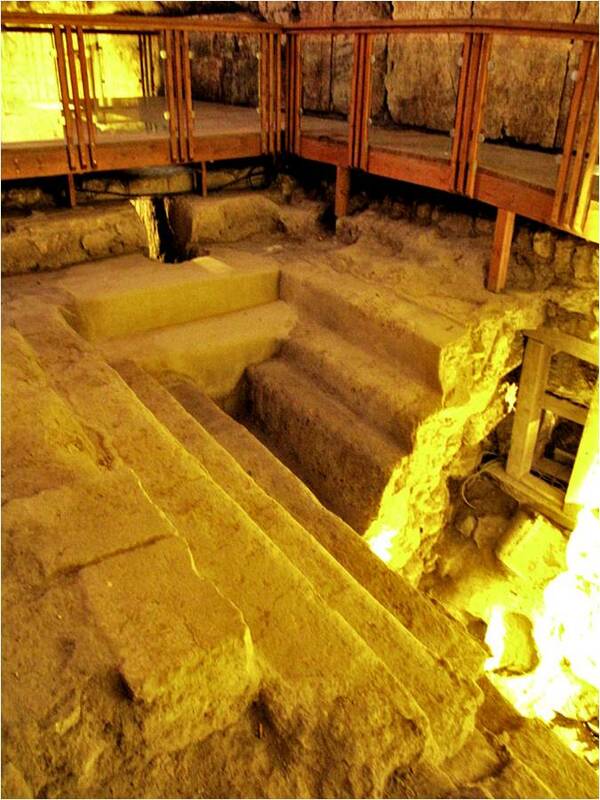 For the excavation of 2016, it was decided to concentrate on the bathhouse and miqve of the shulhoyf. Written sources inform us that a pipeline was established in 1759 to bring water from the Vingriu springs to the synagogue complex. It supplied water to the communal 'well' (actually a cistern), the bathhouse that included a miqve and the public latrine. Previous Ground Penetrating radar (GPR) and Electrical Resistivity Tomography (ERT) scans, together with mapping of the site guided us in the exact positioning of the underground remains of the bathhouse and enabled us to prioritise for the 2016 season of excavation. Due to the significance of the anomalies of the geophysical scans, we identified two clear potential excavation sites. Within just a few centimetres from the surface significant remains of buildings were discovered. 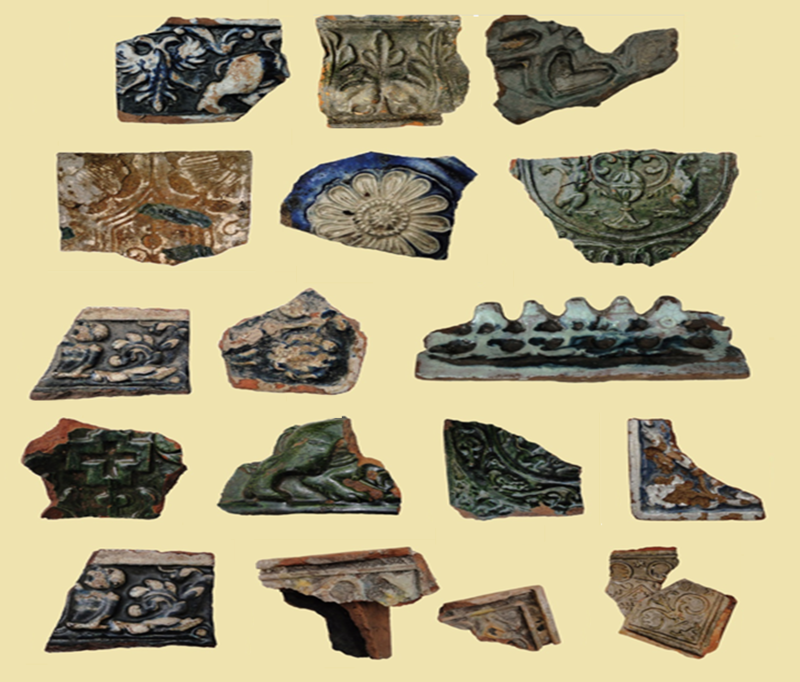 These included brick walls, underground vaults and large quantities of small finds, including beautiful glazed stove tiles similar to those uncovered in the Palace of the Grand Dukes of Lithuania in Vilnius. 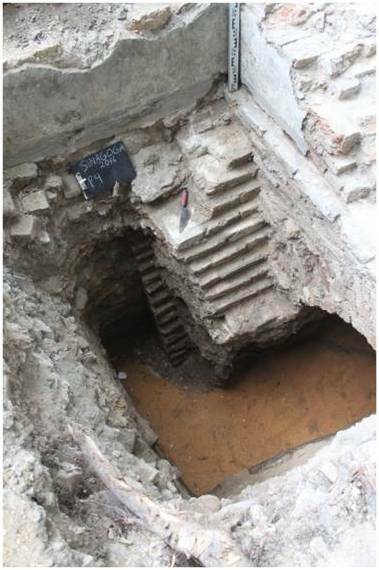 In June 2016 we conducted a short two week excavation in the area of the bathhouse and miqve in the shulhoyf of the Great Synagogue of Vilna. 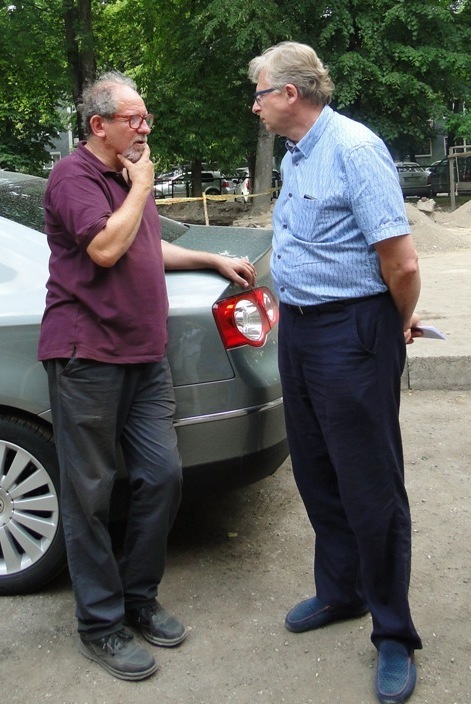 The work was directed by Dr. Jon Seligman of the Israel Antiquities Authority and Mantas Daubaras of the Kulturos paveldo išsaugojimo pajegos (Culture Heritage Conservation Authority of Lithuania). 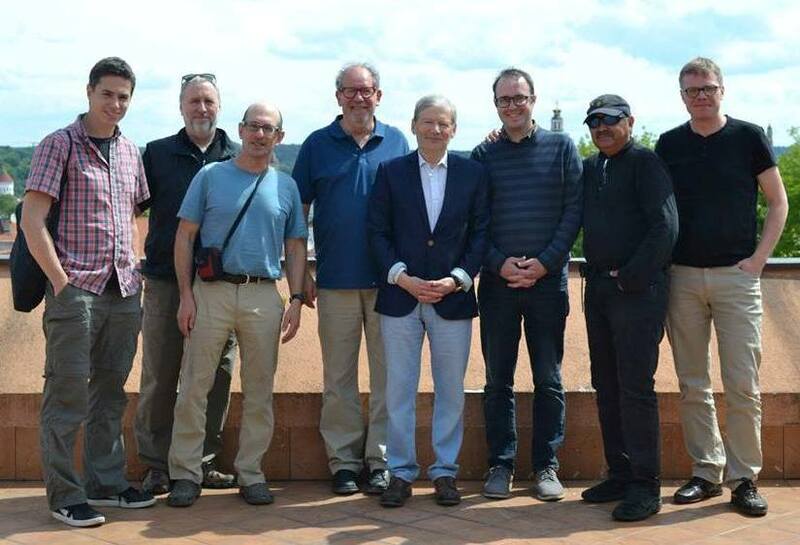 The excavation was aided by Zenonas Baubonis (Kulturos paveldo išsaugojimo pajegos); Prof. Richard Freund (Maurice Greenberg Center for Judaic Studies, University of Hartford); Prof. Harry Jol (University of Wisconsin, Eau Claire); Prof. Philip Reeder (Duquesne University); Paul Bauman and Dr. Alastair McClymont (Advisian-Worley Parsons). The team would like to thank the students and volunteers from Israel and America and our workers from Lithuania. 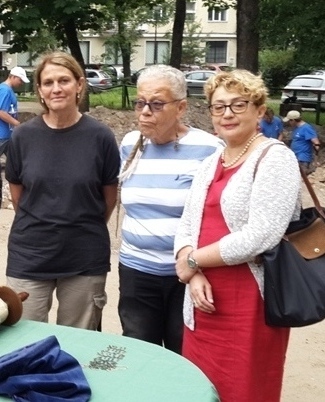 We also thank Director, Diana Varnaite of the Department of Cultural Heritage under the Lithuanian Ministry of Culture for official permission and Faina Kukliansky, the President of the Jewish Community of Lithuania, for her support. 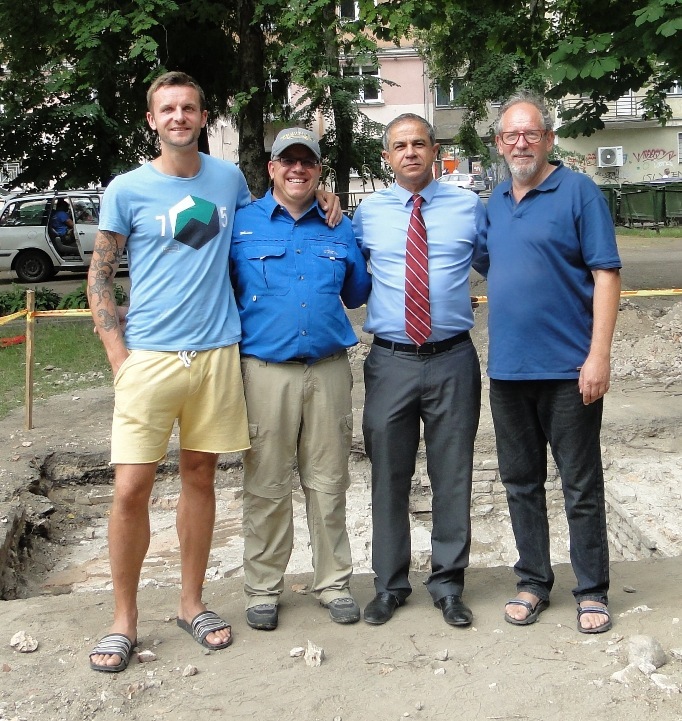 Our gratutude is also due to the principal and staff of the Vyte Nemunelis school for enabling the excavation within the school grounds and allowed us to use the school facilities. Copyright © 2017 Jon Seligman. All Rights Reserved. 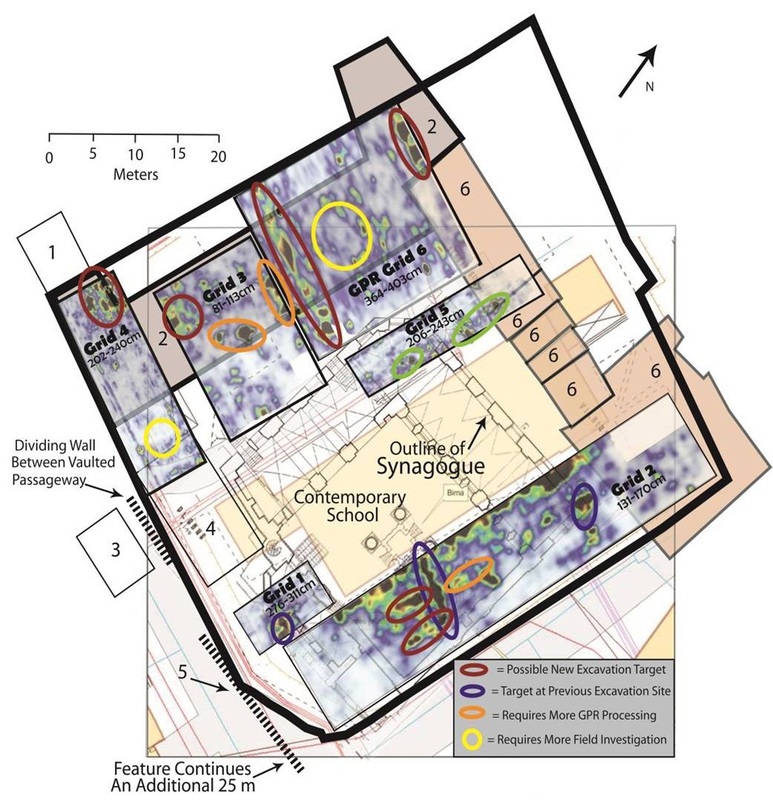 The successful outcome of the preliminary excavation of 2011and the 2015 Ground Penetrating Radar Survey, show the potential of continued excavation at the site to uncover further sections of the Great Synagogue and the surrounding buildings. These preliminary activities enable us to gauge the exact positioning of the underground remains and to better understand the archaeological potential of the site prior to the investment of further resources to fully uncover the remains through excavation. 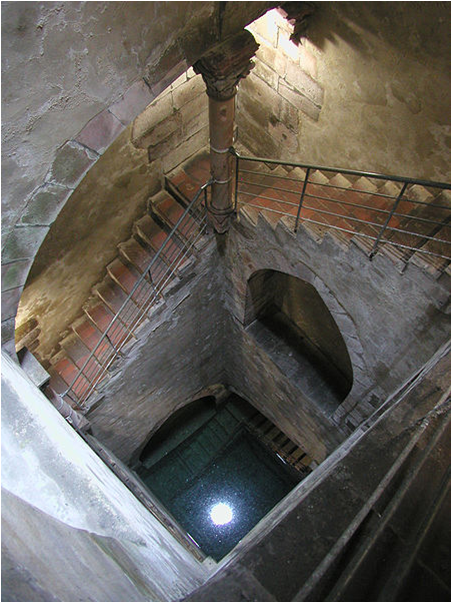 Given the resources available to the team, we decided to initially concentrate on issues relating to the water system of the shulhoyf that developed in and around the Great Synagogue in the 18th century. Written sources inform us that a pipeline was established in 1759 to bring water from the Vingriu springs, that belonged to the Dominican friars, to the synagogue complex. It supplied water to the communal 'well', and apparently to the bathhouse constructed in 1823-28 that included a miqve and the public lavatory. We hope that excavations could reveal the water supply system, the interconnection between the three communal water facilities and even the miqve'ot themselves. Though the book of Leviticus (Lev 15: 13, 16, 19) makes clear the need for Jewish ritual purity, before the beginning of the first century BCE, neither written sources, nor archaeology gives any indication about the existence of specific installations used for ritual cleansing. Such ritual cleansing or tahara, through total immersion in a pure water source, is required to remove impurity or tumah before conducting a series of activities, including entering the temple, the resumption of sexual relations after menstruation, consecration of a priest (Kohen), conversion and more. 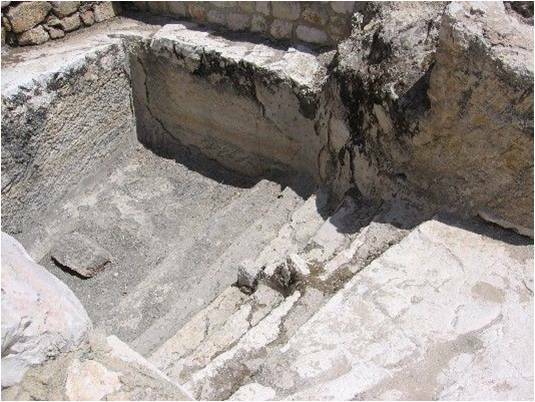 Archaeological evidence of miqva'ot (ritual baths) only appears in the Land of Israel from the beginning of the 1st century BCE. 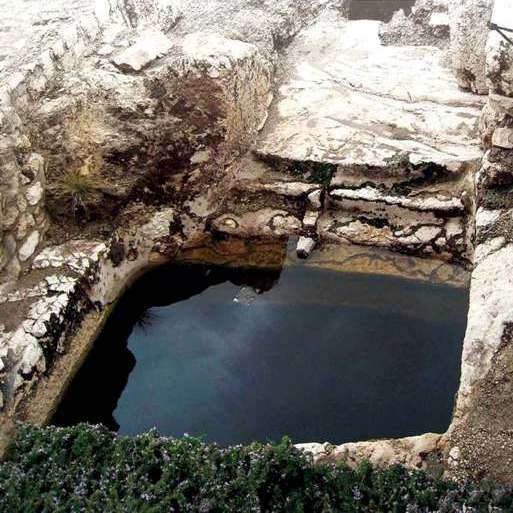 Excavations in Israel have exposed hundreds of stepped pools, identified as a miqve'ot. The halachic rulings detailing the requisites for purity and the provisions for the miqve were discussed and detailed in the Mishna. Indeed, so central to Jewish ritual was the presence of a miqve that a Jewish community would construct a miqve before building a synagogue. The Mishna requires the miqve to be 3 cubits deep, 1 cubit wide, and 1 cubit long, the necessary volume of water being 40 seah of water, enough water to cover the entire body of an average-sized person. Though the exact volume referred to by a seah is debated most Orthodox Jews use the stringent ruling of the Chazon Ish (Avrohom Yeshaya Karelitz) a rabbinical authority who spent thirteen years in Vilna prior to moving to Eretz Israel in 1933, according to which one seah is 14.3 litres, and therefore a miqve must contain approximately 575 litres. Usually a miqve will be a stepped pool, the lower step wider to allow complete immersion of the body and a lower dipping area. In fact impurity can be nullified through immersion in any natural water source, known in the literature as 'living water'. Such sources include the sea, rivers, springs and the aquifer. A cistern filled by the rain is also permitted to act as a miqve's water supply. The miqve simplifies this requirement, by providing a bathing installation containing water from a suitable natural source. The rules, though complex, provide solutions where a suitable natural source is not available, such as in Vilna. Here water can be channeled to the miqve if the water flows by gravity to the miqve from the natural source. However, water cannot be pumped or pass through a closed vessel. A general history of miqva'ot in the diaspora has yet to be presented, though medieval installations have been found in Syracuse in Sicily; Besalu in Spain; a number of sites in Germany, Poland and Holland. Most of these miqva'ot use ground water, many of them dug deep into the ground and accessed via deep shafts surrounded by staircases. Others, especially those in eastern Europe, were built beside rivers, presumably channeling river water through to fill the miqve. 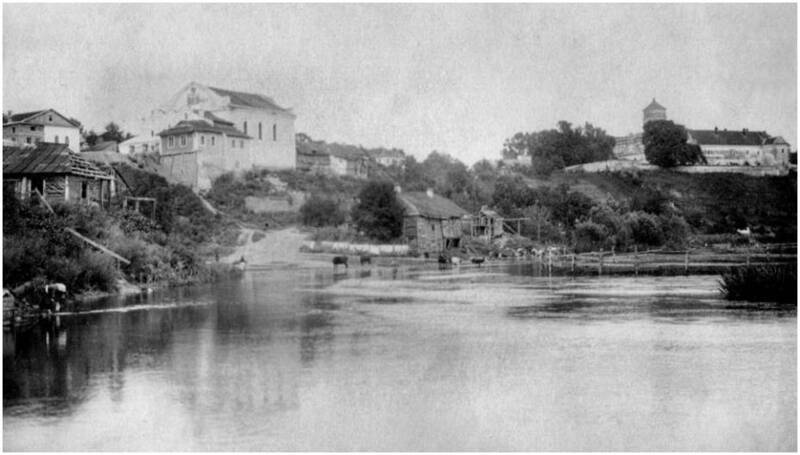 The miqva'ot of the Pale of Settlement or Lithuania await study, though historic installations exist Plunge, Indura, Labun, Kretinga, Iziaslav (Zaslaw), Švekšna and Aispute. 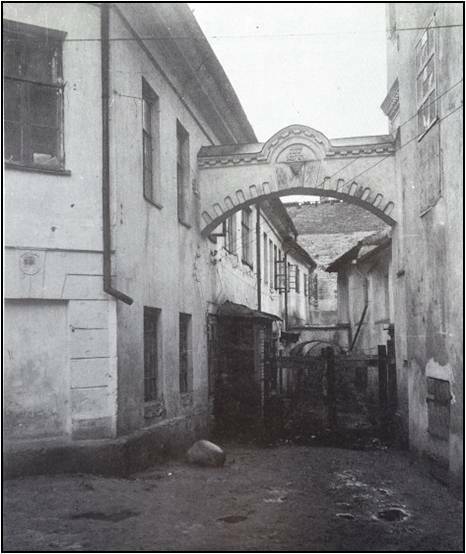 What do we Know about the Miqve and Bathhouse of the Great Synagogue of Vilna? 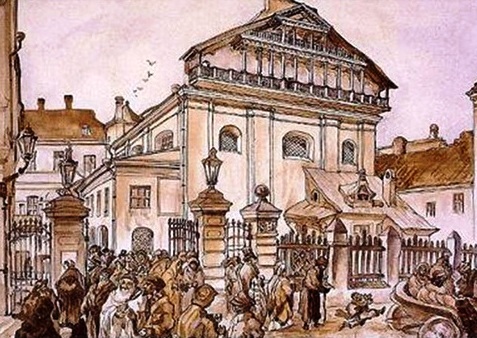 Almost all the accounts of Great Synagogue of Vilna and the shulhoyf concentrate on the Great Synagogue itself and the surrounding kloyzn (prayer halls). We know surprisingly little about the miqve in the shulhoyf. Two major sources note the miqve in passing, the first a history of the Jewish community of Vilna written in 1934 by Israel Klausner and the second, a Yiddish guide book for Vilna, published by Zalman Schick in 1939. 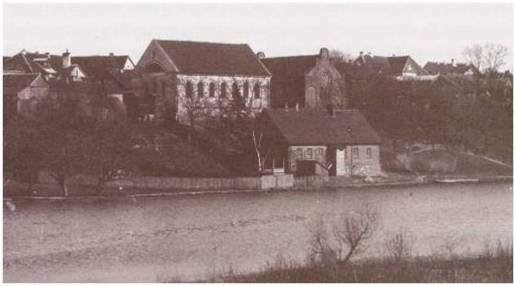 The Vilna Municipality had arranged water supply and sewage removal for the city and the Jewish streets should have been able through written privilege to use them with minimal payment. But the municipality did not fulfill its commitments to the Jewish quarter and the Jews were forced to organise their own water supply, for consumption and fire fighting, and also sewage removal. 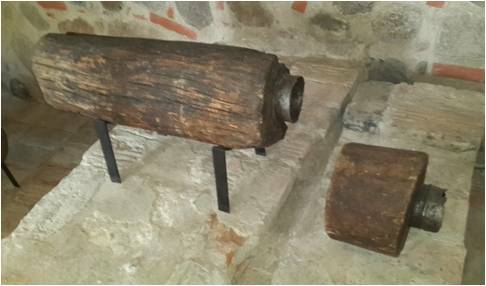 The nearby Vingriu springs had been given by the Duchy to the Dominican friars and they charged for the community for use of the water 200 gold pieces for channeling the water through wooden pipes to the Shulhoyf. The Jews also paid for the digging of wells at the spring. In a contract of 1759 Jews were only allowed to channel water to the Shulhoyf itself. Water could only be taken for public use there and no additional pipes to the homes and courtyards were permitted. The cost of the payment for the water and the maintenance of the pipes proved difficult for the community and a maintenance committee, known as the Bedek Bayit sociey was established to maintain the flow of the water, replace pipes, clean the well, arrange sewage removal, collect refuse and to manage payments by individual households and businesses. From the accounts we learn that the Vilna Gaon was charged 1.20 zloty for his water. Underground sewage pipes drained the Shulhoyf, the bathhouse and the public latrine. In 1772 the community received permission from the Jesuits to connect the sewage from the Shulhoyf to the sewage of the Jesuits. The sewage passed in pipes below the Jewish streets to those of the monastery and thence to the river. 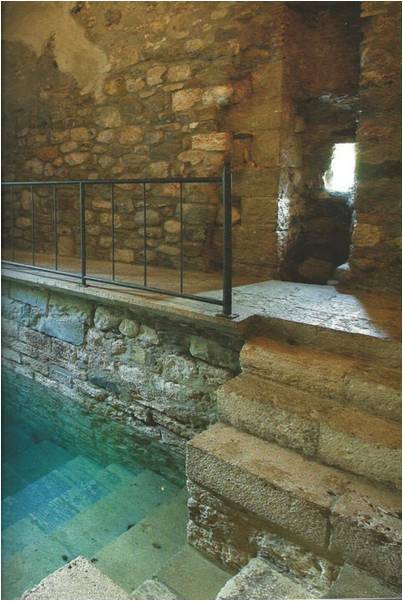 By the mid-17th century the bathhouse was one of the major sources of income of the community. To maintain this monopoly, the community forbad anybody else to operate a bathhouse or miqve elsewhere in the city. Furthermore, women were forbidden to bath in the river, forcing them to come to bath at the bathhouse and to purify themselves at the miqve in the Shulhoyf. Still, the accounts note however that the bathhouse was often poorly maintained and even in danger of collapse. On a number of occasions we see at least three attempts to renovate and rebuild the bathhouse. In 1875 the community submitted a renovation plan to the municipality for the redevelopment of the bathhouse. 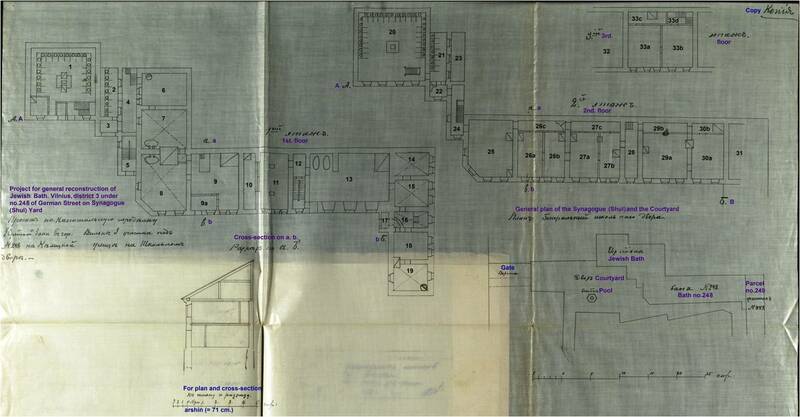 The plan, which is signed as approved by the Tzarist Governor of Vilna, shows that the bathhouse consisted of two main floors and many rooms. In many of the rooms is a square feature cut through with a diagonal line. In our opinion this feature is a stove used to heat each of the rooms. At the southern end of the building are two latrines, divided by cubicles, on both floors of the building. These are likely designated for males and females. Two rooms, rooms 9 and 16, on the ground floor contain the miqve baths. These are as to be expected, stepped installations, facts that only excavation can verify. In the corner room 16 is a narrow wall that may indicate an otzar, a small pool used to allow water to flow over the miqve to keep the water pure and topped up. These plans should be a very good guide to the architecture of the bathhouse and the miqve. However, given the preliminary stage of the excavation and because of the rarity of photographs of the bathhouse, we cannot yet assess whether the plan was fully implemented, though the limited data available from the only known photograph of the bathhouse would suggest the building was as described in the plan. Notable is the supporting arch that stretched from the bathhouse to the back of the synagogue. The date 1881 on the arch gives the date of the construction of the arch and probably the reconstruction of the bathhouse. Still the state of the bathhouse remained poor, leading the Joint to donate $20,000 for further repairs in the early 20th century. By 1939 the bath was again closed and the community were making plans to reopen the installation before the events of WWII caught up with them. The bathhouse was ransacked by the Germans during WWII and demolished together with the other structures of the shulhoyf by the Lithuanian-Soviet authorities in the mid-fifties of the 20th century. In the Shulhoyf was a simple bath and a good bath. To the simple bath one would first climb the steps to the ‘pakstob’ (changing room? )’ and then go down thirty steps to the lower floor to bath. The steps were slippery and frequently people slipped and were injured. 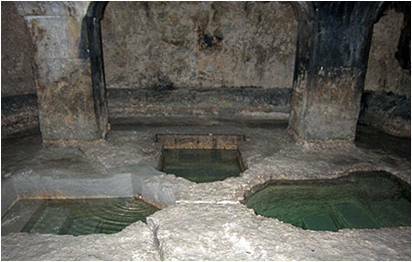 The cool bathhouse, where people bathed, had a pump at its centre, and two gentiles always stood above and pumped up and down water. The walls were as black as coal. The cubicles of the changing room were infested with cockroaches. From the corners of the bathhouse could be heard the croaks of frogs. From their hiding placed could be heard the chirrups of grasshoppers. On the evenings of Yom Tovim (festivals) the bathhouse was open all night. When the bathhouse closed the Joint donated money to renovate the bathhouse as it should be in Vilna. Some $20,000 were invested in the repairs. When the renovation was finished the community rented out the bathhouse to a Jew who didn’t want to pay any money and kept running to the community office to ask for subsidy on the excuse that the bathhouse owed money. In the end the community almost solved the problem of the bathhouse and was happy to place a lock on the bathhouse. Now (1939) the community intends to reopen the bathhouse. 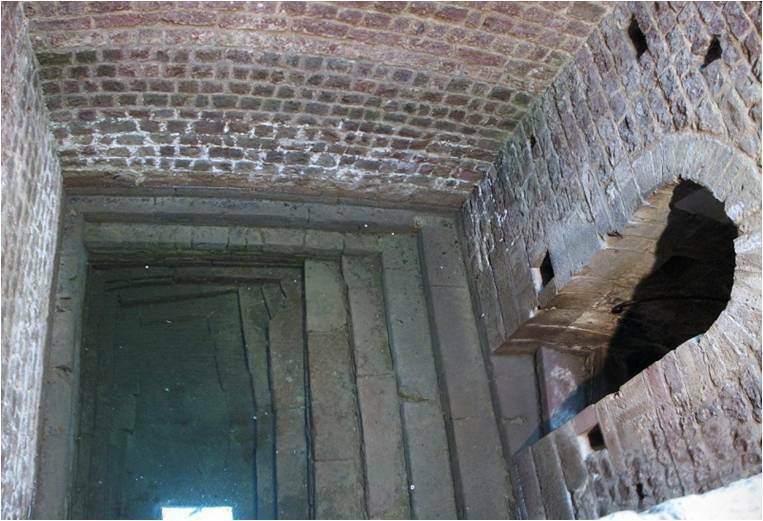 Given our research questions, the results of the GPR survey and our historical research, it was decided to concentrate our work on the bathhouse, with the specific aim of identifying and exposing the miqve (ritual bath). The season commenced with the completion of the geo-physical survey using Electrical Resistivity Tomography in the areas where significant anomalies were indicated by the GPR survey in 2015, with the goal of pin-pointing different structures and artifacts. As the renovation plan only reached us late in the excavation, we identified two separate squares totaling 50 square metres in the area to the north of the school where the geophysical anomalies present the greatest potential for excavation. The finds from the better archaeological contexts included coins, bones and large quantities of ceramics, the significant find being multichrome glazed stove tiles. 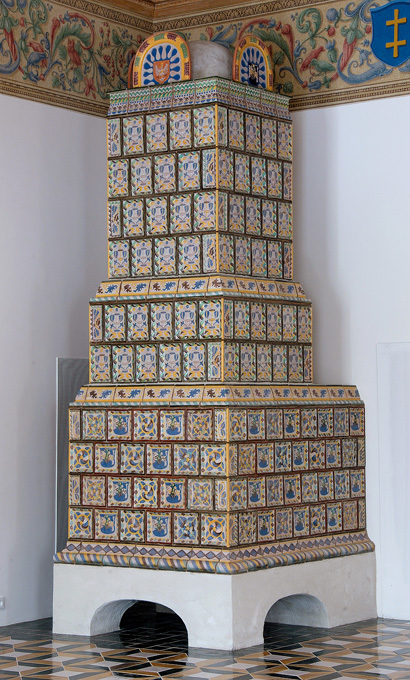 These tiles, decorated with heraldic emblems, vegetative details and animals are typical of heating stoves from the 18th to 19th centuries. Similar decorated stove tiles are typical of finds from the Palace of the Grand Dukes of Lithuania. We also collected large quantities of bones. A question arises whether the dietary information provided by the discovery of fish bones, animal bones and even botanical data can suggest a significant dietary difference between the Jewish and general population. The first excavation trench was set metres from the corner of the plot. This area showed on the GPR plot (Grid #3) as an area of high archaeological potential, while the ERT scan showed a very clear anomaly, possibly for metal. 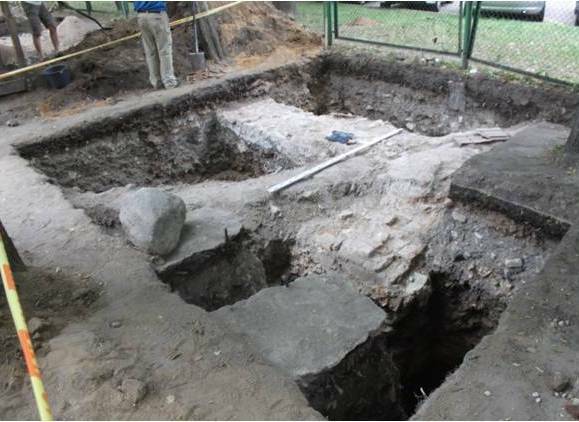 A trench measuring 2.5 x 10 metres was opened, crossing the place of the bathhouse building from side to side, with the internal space of the Durchhoyf on one side, and the outside of the Shulhoyf on the other. After the removal of the top layer of dark organic top fill walls quickly appeared allowing us to divide up the area into a number of rooms. The largest room (L2) had a concrete floor. It was built over a vault built of brick, set directly on the natural sand that typifies the area around Vilnius. 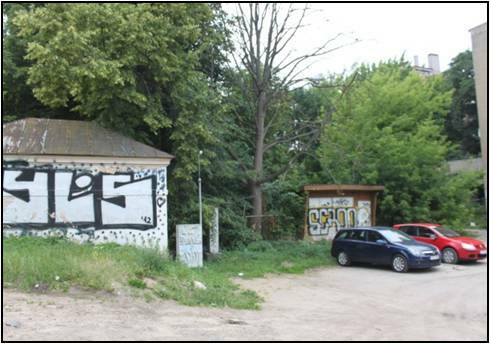 After superimposition of the excavation on the plan of the 19th century we learnt that this space was room '12' of the bathhouse. South of the southern wall (W3) of this room was brick debris that covered an underground vault built of brick (below L1). 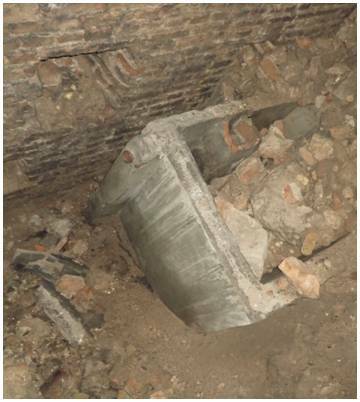 Once we removed a brick we were able to lower a camera and see a large intact metal element, probably a water heating stove. The second trench was also cuts in an area with good GPR potential. 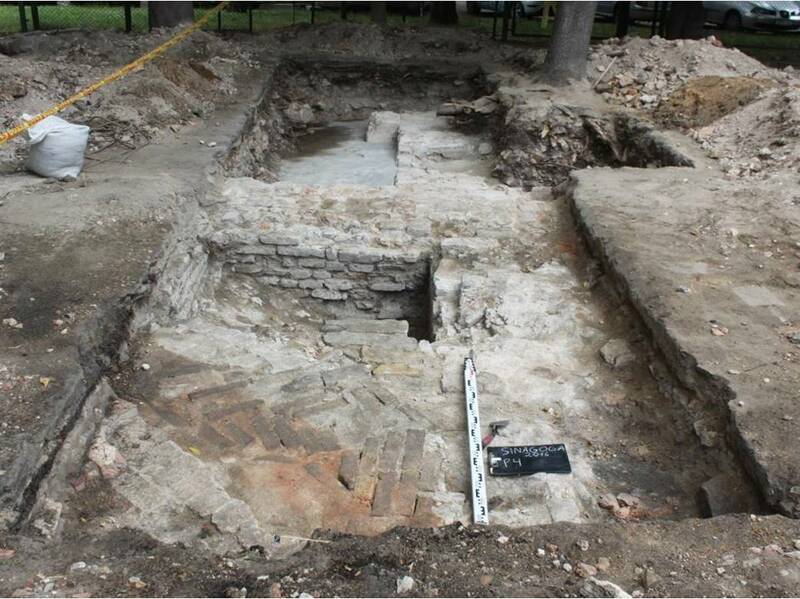 A thick brick and mortar wall passes through the trench from side to side, possibly being a wall close to the back corner of the bathhouse. The excavation of 2016 was superimposed on the 19th century plans, which in turn have been interconnected with the plan of the Great Synagogue and the shulhoyf. These plans are a very good guide to the architecture of the bathhouse and the miqve and will guide us in our aims in the planned excavation for 2017. While the finds were limited in scale these remnants of the complex of the Great Synagogue show the potential for further excavation at the site, for the exposure of the entire site, and for the display of the ruins in a similar way to that so excellently presented at the Palace of the Grand Dukes of Lithuania in Vilnius. This would be a fitting memorial to what had once been the 'cathedral' and community centre of the Jews of Vilnius.